This is one of my favourite summer salads. It goes great with Spatchcocked Poussin or Kuzu Pirzola. Dress with Honey Mustard Dressing. Serves 4. Wash and dry the salad leaves, add them to a salad bowl with the sliced red capsicum, and toss them with the Honey Mustard Dressing. Cut the avocado in half length ways and remove the stone. Run a teaspoon around the inside of the skin to gently remove the flesh, and slice the avocado into thin slices. 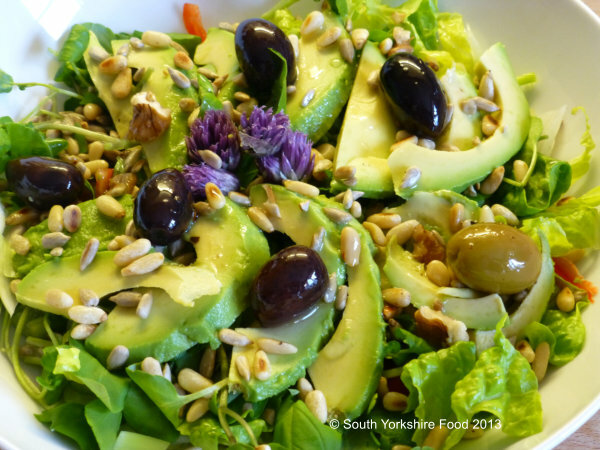 Arrange the avocado slices on top of the salad leaves, and toss the olives and nuts over the top.